It’s that time of year – the unofficial start of the unofficial holiday “Butterfest”, that period from October 31st to January 1st. Seems like starting with our wickedly wonderful tradition of begging for treats, comes a landslide of temptations and an overload of sugar and fat. How DO you manage to enjoy but not overdue, especially with candy? *Buy late and don’t open the bag until Halloween night, less temptation. *Choose candy you don’t like. *Give out more candy as the night goes on so there’s little to none leftover. *Start the evening with a full stomach, you’ll be less interested in the sweet treats. *Manage the kids’ haul. 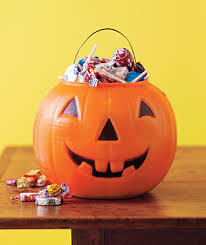 Have a game plan for parsing out candy over the coming weeks. *Remember you can buy candy ANY time of year. No need to load up now. Having a Halloween party? Try these clever, delicious, and healthier Halloween snacks…(URL: http://www.webmd.com/food-recipes/features/ghoulishly-healthy-halloween-snacks). Try using any of these ideas for a healthier Halloween and fall celebrations!